Have you got some MTS video files and don’t know to easiest way to edit MTS files, such as trim mts files, crop mts video, adjust aspect ratio of mts files, add watermark to mts videos, convert MTS to any video formats, etc. Acrok MTS Converter for Mac/Windows the best MTS video converter on the market, which can help you to convert MTS to rich formats for editing software, smartphones, tablets, etc. 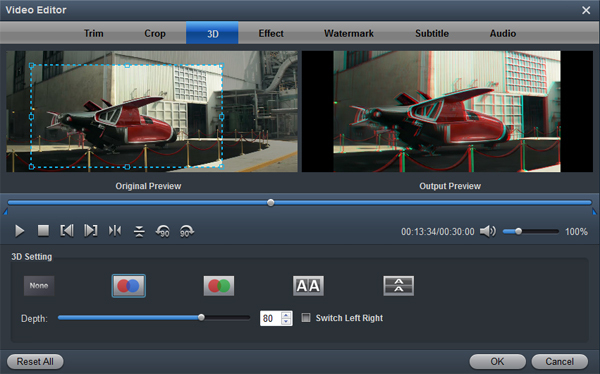 With this program you can also edit MTS video files with easy-to-use video editing features. Now we start to show you the edit feature of Acrok MTS Converter. Trim: The “Trim” feature allows users to decide where to start and where to end when converting the selected clip, so that unwanted segments will be cut out after conversion. 1. Drag the control sliders mts m2ts mac slide 1mts m2ts mac slide 2to include the segment you want to remain. 2. Click the left square bracket mts m2ts mac start pointto set start point, and click the right square bracket mts m2ts mac end pointto set end point when previewing the video. Acrok MTS Converter for Mac offers “Previous Frame” and “Next Frame” options for users to select frames and trim accurately. Crop: The “Crop” facility enables users to get rid of the black edges and unwanted area of the image. There are “Simple Mode” and “Advanced Mode” under Crop feature. In “Simple Mode”, you can customize values in the box of “Left”, “Top” and “Crop Size” to make your crop decision. To keep original aspect ratio, users need make sure the “Display aspect ratio” and the”Size (pix)” in “Settings” option are all set as “Original”. If you want to keep the cropped aspect ratio, Acrok software offers several aspect ratios for you to choose from, including 16:10, 16:9, 5:4, 4:3, 3:2, and 2:1. Once you selected a”Display aspect ratio”, the “green crop frame” will keep this ratio to crop video and you are able to preview the final effect in real time. If you want to keep the same aspect ratio in your final output files, do remember to set the Video “Size (pix)” in “Settings” section as the same ratio as display aspect ratio. For example, if you want to export a file with “3:2″ aspect ratio, firstly, you choose “3:2″ in “Display aspect ratio”, and then go to “Settings” section to adjust the Video “Size(pix)” as 720×480 or 1440×960. After finished, click “OK” to confirm. Note: If you are using a trial version, there will be Acrok logo watermark in the middle of output files. To get rid of the logo watermark and get better performance, please buy full version.